‘With laughter and delighted greetings and in the highest of high spirits San Francisco’s young people met on Monday night for the first of the season’s skating parties. They were unfeignedly glad to be together again […] From 8:30 o’clock until nearly midnight the enthusiasm lasted without an instant’s break, and perfect music and a perfect floor did their share to make the evening pleasant. It was a large meeting, more than 200 persons were there’ (San Francisco Call, 1907). ‘The new skirts are charming. 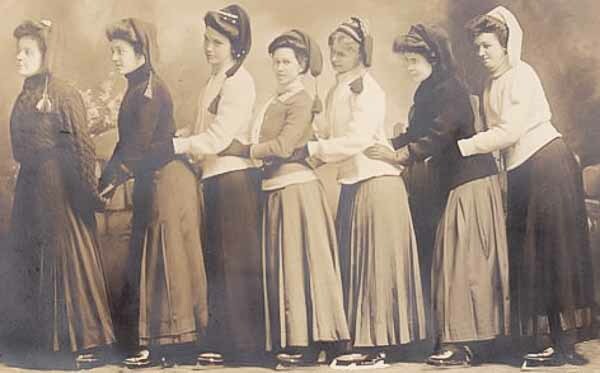 They fit closely the figure, but are given sufficient flare below the hips to allow of plenty of fulness and swing – a too scant skirt is ugliest of all for skating, then just around the hem there is considerable width’ (Los Angeles Herald, 31 January 1909). 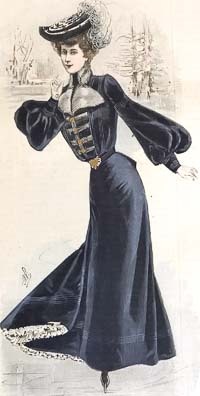 ‘Strange to say, the Directoire coat, with its loose back and trimmings of straps and buttons, does not look too exaggerated for a skating costume’ (Los Angeles Herald, 3 January 1909). ‘For the moment the toques and the turbans are receiving most unanimous approval and certainly they are becoming and smart. […]The long haired furs are the more popular this season in hats, but there are a few of the broadtail and caracul still to be noticed; sealskin has never been classed with the long haired furs, but the imitation sealskin is, generally speaking, longer than the real, and it is probably for that reason this year that the fashionable fur toques and turbans include sealskin. 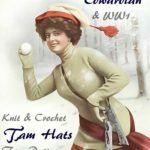 There are many distinct varieties in these hats, the round, large shapes having been until now the smartest, but just within a short time have appeared larger, more irregular shapes in fur that have met with instant approval. They also are enlivened by the big curled feathers, the well known Mephistopheles feathers, the height of which reaches beyond the bounds of reason in many instances. Swansdown, white and dyed, and mar about toques are charmingly becoming and are worn, as are the fur turbans, with skating and walking costumes, but they are really not so suitable. Then there are the fascinatingly becoming soft shaped hats in these same shapes but made of cloth or velvet or a combination of both these materials. Embroidered velvet combined with plain velvet or with cloth is extremely effective, while for evening the velvet toques and turbans with bands of jet are more and more in favor. ‘A chiffon veil is the best, as it will not let the biting winds chap the face so readily as an open mesh, which is no protection at all, save that it acts in the capacity of net in keeping stray hairs in their place. 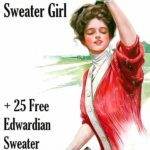 ‘In gloves, heavy pigskin or gray castor are both smart, while for the country fur lined leather or white woolen gloves are equally popular, the woollen being of course the more thoroughly comfortable as well as the more durable. 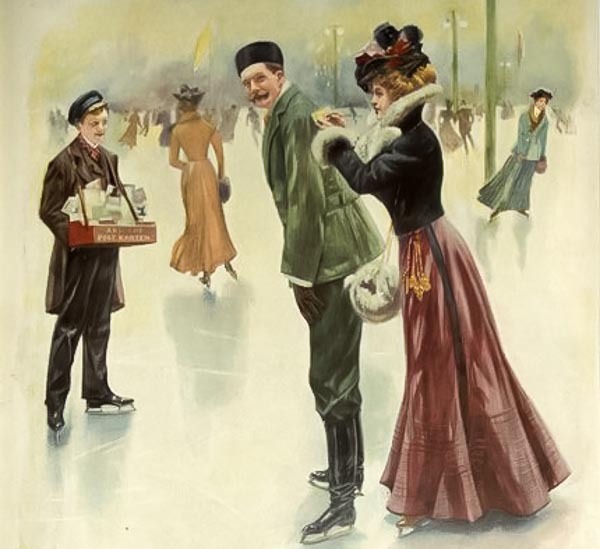 ‘For indoor skating a rather more elaborate style of dress is worn than is considered appropriate for the country. A simple but pretty gown throughout of smooth cloth or serge will be warm enough for active exercise, with a fur or fur lined coat to put on the moment that one leaves the ice. 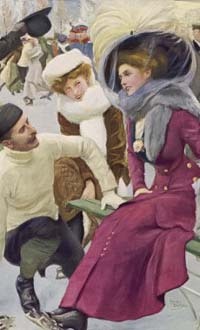 It is essential that the wrap be very warm and the dress itself not too heavy, as in a rink the damp air is peculiarly penetrating, although the cold is scarcely noticeable while one is actually skating. If proper precautions are taken that the coat be put on immeadiately one sits down and that too heavy garments are not worn while on the ice there is little or no danger of taking cold in a rink, but so soon as the skater becomes overheated and then rests in the damp, unnatural atmosphere a risk is incurred. 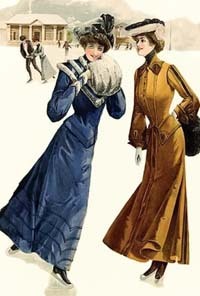 ‘There is little of the practical but much of the picturesque in some of the gowns to be seen at any of the indoor rinks in Europe or America, but there is an immense amount of charm about them […] A skirt of cloth or a plain velvet with a fancy coat of brocaded velvet trimmed with fur and worn with a fur toque to correspond won admiration last season and has been copied again this winter with just a few small modifications to make it up to date. Red cloth trimmed with the skunk fur so very popular this winter makes up most effectively, but, there are shades of blue and green that are in constant demand. These are trimmed with the same fur or with bands of mink. 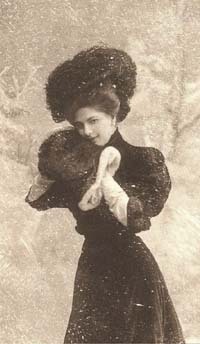 The most costly of all the fur trimmed gowns are made of velvet and trimmed with chinchilla. A gray velvet with this fur is exquisite in coloring and, almost without exception, is becoming. 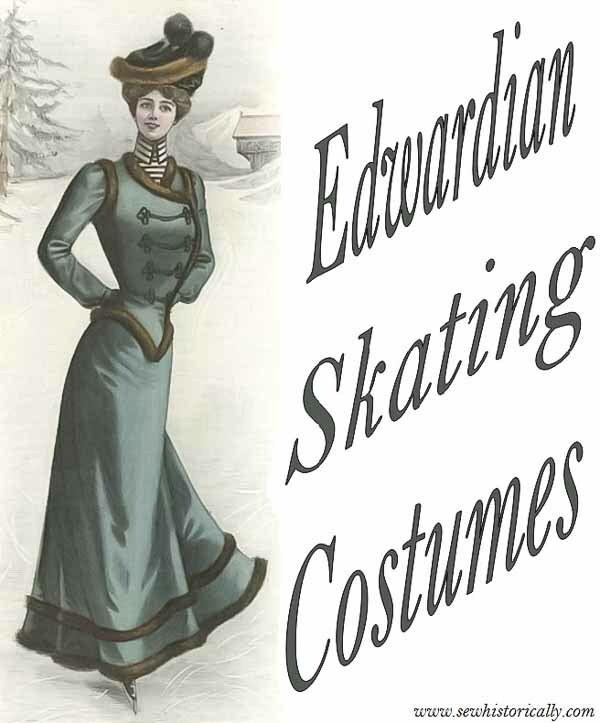 Follow my pinterest board Edwardian Sportswear for more pictures of Edwardian skating costumes & sportswear! This is an amazing post! Thanks for sharing it. 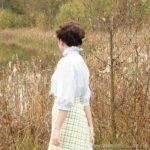 My daughter does costume design and sells on Etsy. She is currently working on a project for a music video set in Edwardian time and is sketching out her design ideas. Your post will be such a blessing to her! If you want to look her up, she’s at bellamaesdesigns.com and at the same name on Instagram. What an amazing post—-I really loved the old articles and the films are amazing. Thanks you so much for putting this together! So interesting, thanks for sharing! I especially love the usage of the word “toque” because that is what we call a winter hat here in Canada. Very informative post. 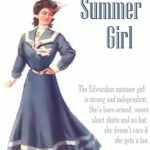 I never knew there were specific clothing for skating for women and that the skirts were shorter. Where did you get all the videos? Nice addition! Thanks, Alice! 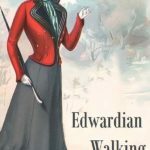 🙂 In the Edwardian era, there were specific clothes for everything: for walking, for business, for the seaside, for morning, for dinner parties … 😉 And the videos are on youtube, published by British Pathe and Eye, both have many old videos if you’re interested. How interesting and informative! I really liked the imagery included in the post. I usually wear jeans and a sweater to the skating rink. I need to step up my wardrobe game 🙂 Thanks for sharing. Dropping by from the Traffic Jam Weekend #173 Link Up.